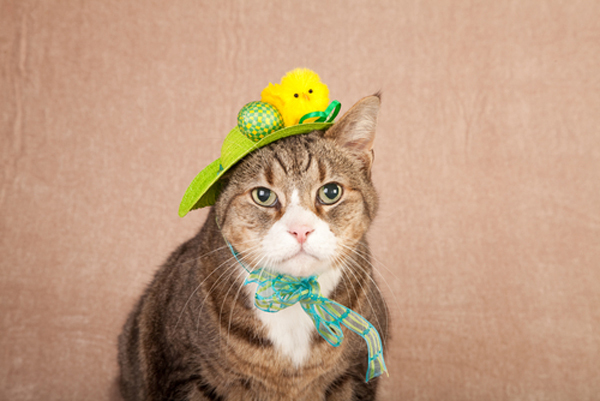 Have you ever done a web search for information about your cat’s claws? It’s a frustrating endeavor because you get page after page of results like, “Cats have five claws on their front feet and four on the back, and they’re designed for climbing.” Well, duh! 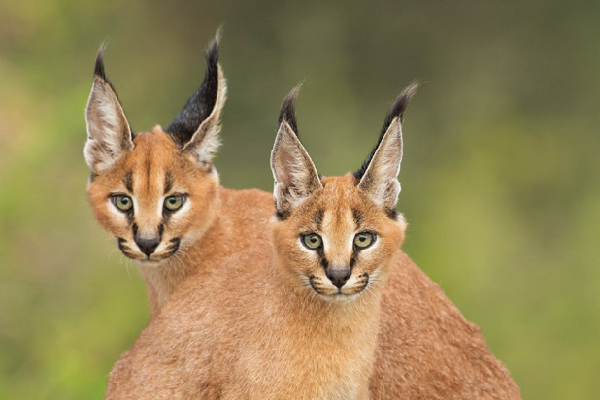 Cats are digitigrade walkers, which means that instead of walking on their heels and the balls of their feet like we humans do, they walk on tiptoe. In this photo, I’ve tried to approximate how a cat’s weight is distributed. This very simplified drawing shows how your cat’s claw is connected to his toes and the rest of his leg. The phalanges (singular: phalanx) are equivalent to your fingers, and the metacarpal bone is the same bone that goes from your knuckle to the heel of your hand. Ligaments and tendons are made of the same stuff, but they serve different purposes. 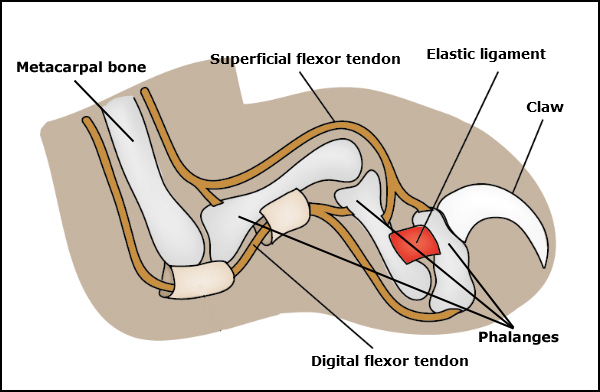 Ligaments connect from bone to bone, while tendons connect bone to muscle. 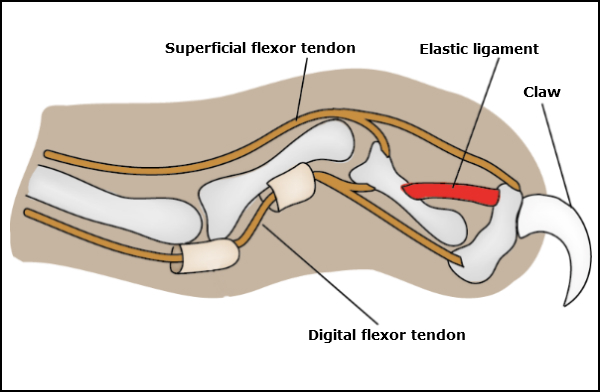 The elastic ligament, pictured in red in the image above, pulls the distal phalanx close to the middle phalanx in order to keep the claws from touching the ground. 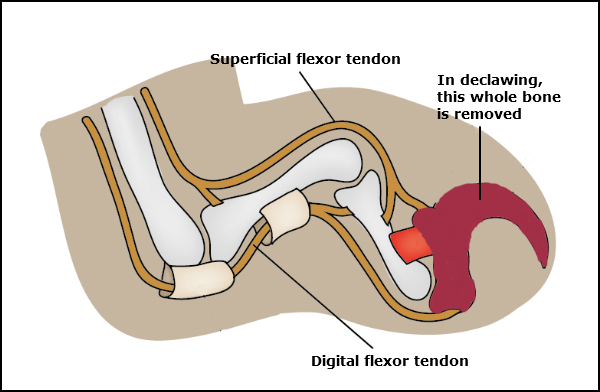 The digital flexor tendon and the superficial flexor tendon (sometimes called the extensor tendon) are also crucial to your cat’s ability to extend and retract his claws. 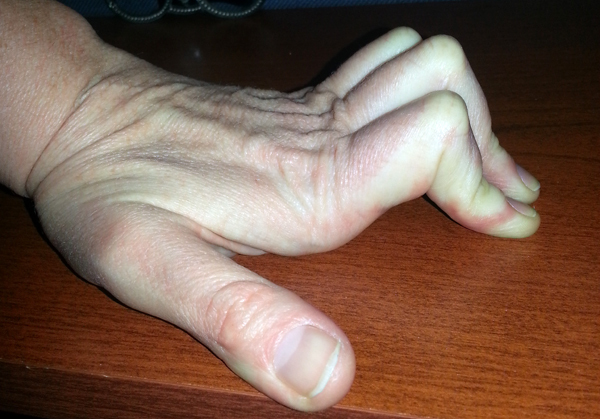 When the digital flexor is relaxed, the claw is tucked in, and when it’s tensed, the claw is extended. 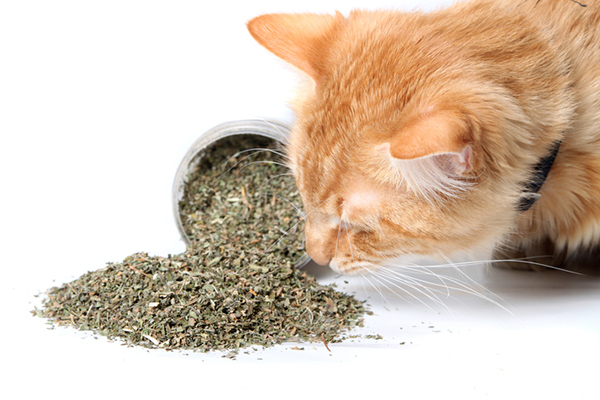 Like all fingernails and hooves, cats’ claws are made of a protein called keratin. Claw tissue grows in layers, thanks to the quick, the living tissue at the core of the claw. The quick contains blood vessels and nerves, which you probably know all too well if you’ve clipped your cat’s nails too short. When you see pieces of your cat’s claws on the floor or embedded in his scratching post, it just means that the outside layer of his claw has grown beyond the blood supply and therefore falls off when he scratches — revealing a nice, sharp new talon underneath! Cats generally shed each claw once every few months. You might have noticed in the illustrations above that it looks like a cat’s claw grows right out of his distal phalanx. That’s because it does. 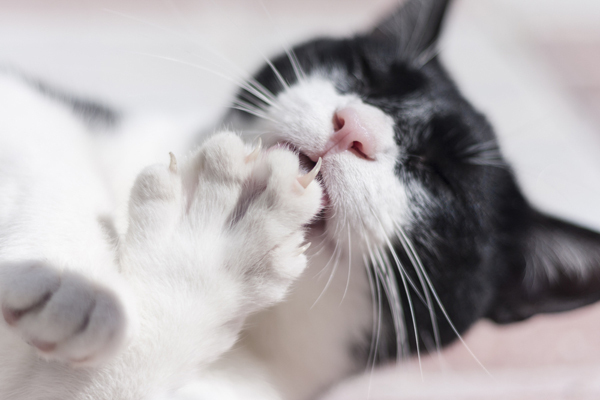 Unlike our fingernails, which are only connected to flesh, a cat’s claws are connected directly to the bone. What that means is that when a cat is declawed, it’s not just a super-mega nail trim. The entire distal phalanx needs to be amputated in order to keep the claws from growing back again. As you can imagine, this makes declawing very painful, particularly since your cat has to walk on what’s left of his fingers afterwards. Do you have any other questions or comments about cat claws — or any other cat science-y stuff you’re curious about? Ask me in the comments and I might just answer your question someday! 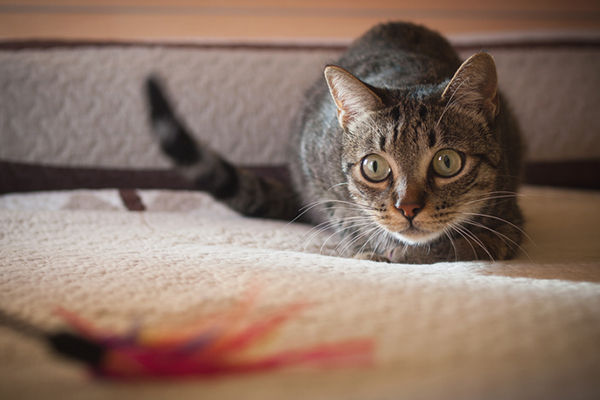 Do You Know Your Cat’s Blood Type? So How DO Cats Always Land on Their Feet, Anyway?